Would I be able to leave out the lay shaft and put a direct drive from the clutch to the axle with a chain centrifugal clutch? What would be the best way to do this? Finding it very hard to get an answer! Hope you can help! You should be able to put a direct drive in place – using a centrifugal clutch on the engine, and connect a chain from there to the rear axle. So for every 4.33 revolutions of the engine shaft, the rear axle will do 1. You have 18″ diameter rear wheels? – These are VERY big. I don’t know if you will have a sufficient gear ratio and the clutch may slip and burn on take-off. It depends on the type and size of centrifugal clutch and if it will take the full 12.6hp. My suggestion is to give it a go and see. If you could get a rear axle sprocket of 60teeth, then that would give a nicer 5:1 ratio. 17 teeth on the clutch/engine and 60 teeth on the rear axle gives you a gear ratio of 3.5 : 1. This is a very low gear ratio. Typically you would want 5 : 1 otherwise there would not be enough torque to move the kart! This is what I think may be happening your kart. When you speed up the engine, it tries to spin the clutch housing, but can’t move the kart forward. Perhaps if you got someone to push the kart, and then speed up the engine, it may take off. Regarding the screw and the clutch hole too big. Is the inside part of the clutch wobbling on the engine drive shaft? ( http://www.kartbuilding.net/gallery/v/Kart_Clearance_and_Memories/DSC01111.JPG.html ) There should also be a keyway that drives this inside part of the clutch. If all this is too loose, the engine drive shaft may be turning, but not turning the inside part of the clutch. This is not easy to fix. Typically when you get clutches you give the size of the engine shaft. 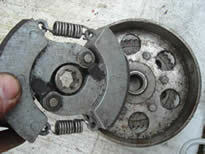 If you want to email some photos of the clutch, your engine and rear axle to kartbuilding@gmail.com I can advise better. size of the sprocket on the clutch : size of the sprocket on the rear axle. You may need to use a smaller sprocket on the clutch. You can get small sprockets for the clutch – I had 10 teeth on mine. Or, you can try and get a larger sprocket for the rear axle. The sprocket on the rear axle would need to be 5 or 6 times the size of the sprocket on the engine clutch. Yes, the clutches I used had a keyway and luckily managed to fit perfectly onto the engine. On one occasion however I had an engine with no keyway. I managed to weld the clutch to the outside of the engine shaft (allowing me to grind off the weld, should I need to remove the clutch in future). I wouldn’t recommend this method however and it would have to be a last resort. Recently purchased a used Honda GX160 from a snowblower. Has an S type shaft,(metric) that is about .789 so the 3/4 centrifugal clutch won’t work. Does anyone make a metric bore clutch? or do I need to get the 3/4 machined to the correct bore. Also the key width appears different so I will probably need to machine a step-down? or do I need to change the shaft? It should be very possible to get a metric centrifugal clutch. It would be way easier than modifying an imperial one what with the keyway and all. 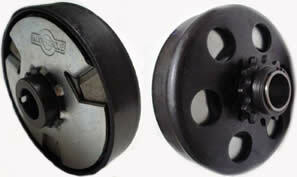 If you contact any suppliers of centrifugal clutches they will be able to help you. I’ve got a machine at home that I’ve built and the engine Im running is a 9hp honda with a 1 inch shaft. So I’ve got a centrifugal clutch on that, that has 17 teeth, the rear sprocket has 52 teeth. The chain I’m using has a 3/8 pitch. My problem is that the chain fits around the sprockets fine but it seems to grab only half or so of the teeth and not lock Into the rest. Does anyone know what’s going on? Both sprockets and chain are new. May be a stupid question but I can’t find a way to fix it. Hi I am thinking of taking a Yamaha zuma X50 scooter that has a automatic dry centrifugal clutch and a CVT as common on these scooters. I want to cut off and remove the CVT transmission and put up a conventional GoKart centrifugal clutch on the drive shaft of the engine. Is this possible? I am doing this for the Shell Eco Marathon project. Your early reply is highly appreciated. I just purchased a 346cc-(11hp) I want to make a my bike to have more torque.Then top end speed which do you suggest? Hello. I have just recently bought a go kart that has a new 11hp motor on it. The torque convertor on the motor I believe was only rated for 8hp and chewed the belt like nothing. So I just bought a Hillard clutch that is rated for 13hp and has 17 teeth. My tires are 22 inch. Now I just ordered a 85 tooth axel sprocket to give me a 5:1 ratio. My only concern is that the Hillard clutch has a #35 chain, so will the new sprocket. Do you think that #35 chain is good enough. I weigh 250lb and I know the go kart is about that much in weight. This wouldn’t be suited to going up hills. You would want a ratio of 6:1 or greater. It also depends on how big your rear wheels are. If you have big rear wheels – then you need a bigger ratio. I suggest you try and get a larger sprocket for your rear axle. You could also try and setup a “transfer axle”, where you use a “middle shaft” and use two chains in order to get a good ratio. @Jason: well If the Hillard clutch with #35 sprocket is rated for 13hp, then it should be ok. I’ve rarely seen chains break on tensile strength. It may wear the sprocket teeth quite quick. Let us know how it goes for you.